While the comment is valid, the chart is certainly misleading. Starting the y-axis at $900MM gives the impression that spending doubles over the next ten years. I make it 5.8% p.a. growth in government spending under the plan from 2013. I’m not sure the premise of the story and graph is entirely fair: the argument isn’t about spending per se, but spending relative to revenue. What the graph doesn’t show is spending growth relative to revenue growth, and how it is intended to grow revenue. Its valid to argue that spending nonetheless remains too high, but my view of the Boehner plan is that you have to start somewhere, and at minimum this reduces the growth in spending. A full-on showdown might get a better result, or it might be a catastrophic failure for those who want budget control. Boehner is making a solid start which is capable of being won (he’s not in the game to lose valiantly). And, once spending growth is reduced to a level below revenue growth, deficit sizes will reduce, and eventually lead to surpluses, reducing overall debt (okay I’ve been smoking some funny stuff lately, but the principle is there). . Boehner’s plan is not enough to achieve this, but it is a movement towards the right direction, and that change is a very important one. If you want to stop the runaway train, the first step is to slow its acceleration. The flip side, revenue growth and how this is achieved, is also extremely important. Obama and the Democrats appear desperate to raise taxes, which should increase revenues (“should” because the rate increase may have a causal reduction effect on revenues raised by dampening the economy). If revenues are grown because the economy is recovering and growing, then well and fine. But if revenue projections rely on tax increases, then all is not well, as those increases are likely to dampen economic performance, and quite possibly reduce revenues. Boehner’s plan avoids tax increases, although it appears to include some reversals of tax benefits arising from the stimulus bill, such as 100% depreciation rate for capital purchases (Obama’s corporate jet issue). While on one level it should be fair enough for business to deduct immediately, the principle has been around for a century or more that this will not normally be the case. As long as the write-off timeframes remain reasonable, then business should be fine with it. 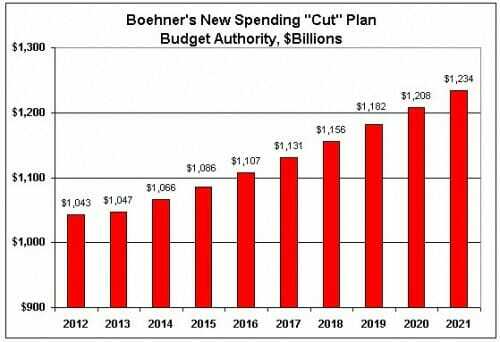 By commencing the process of stopping the speeding train, and resisting tax rises, Boehner’s plan makes a good start. The simple reality however is that the real correction to the economy won’t start until early 2013 when a new President and Senate (I’d be surprised if the House changes that much, except for an even smaller Democratic Rump) start undoing the damage in a consistent and systematic way. +1 on the Chris's chartjunk comment. Your point is undermined by setting the origin at 900 billion. And hey blokeinfrance: greetings from le Gers. "...this reduces the growth in spending"
Which accomplishes exactly nothing. Any planned "reductions" in future years are completely irrelevant, simply because Congress passes a new budget each year. Hence, the only way to truly ensure spending is reduced is to eliminate needless parts of the government. Of course, Senator Paul proposed exactly this, and was voted down 7-90. Frankly, his proposals were rather mild, but they would have at least eliminated a small part of the complete nonsense that the government funds. In turn, this would have reduced actual spending, not just planned spending. From the vote results, it is sadly clear that Congress still does not understand: we are broke. We are entering the same financial territory as Greece, Italy, Ireland, Portugal and other financial superpowers. Fixing this mess now would be painful, but in a very few years, no fix will be possible. It is the end of the "Republic", we just don't know it yet. Our credit rating will go down resulting in a higher cost to borrow. Higher interest expense will offset any "cost cutting" being done now. The Fed will step in to subsidize by purchasing more of our debt. That's right our Fed purchases our debt. Treasury department debit cash, credit bond payable. Fed debit bond receivable and credit cash (print money). Add to that the inevitable run of inflation ahead of us and wallah, welcome to the newest 3rd world country. And you didn't even need to buy a ticket to get there. The reason for the crises is very simple. People are not paid enough to buy what they have produced. When this happened, the businesses decrease the production and the workers are laid off. So it is not the overproduction to blame, but the over exploitation. If it was the overproduction, then there will not be billions of people dying of hunger. If though there is overproduction, then the working day can be decreased to two or three hours, and there will be no unemployed people. In other words, the concentration of the capital in the hands of few people is the main reason for all the evils in the world. Slavko, you don't really believe that tripe do you? In a market free from government manipulation, production and consumption will work toward balance. If people can't buy what is being produced, then business will adapt to produce what people can buy. You have a very European "socialist" view of how markets work.